Warm bodies drive the gears of political and legal action. Getting involved with political action groups that support your initiatives, volunteering for organizations that share your political voice, and attending lobby days are all ways for you to reclaim your political power and have your voice heard! Lobby Days, or Advocacy Days, are organized events bringing people together to act as lobbyists in support of a group’s message and they are happening often during the legislative session while lawmakers are here in the capital, so NOW is the best time to get started! Starting today, April 4th, with the Texas Rising Advocacy Day. 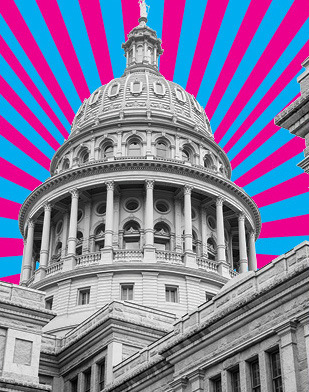 Texas Rising is bringing together 100 young, diverse Texans to advocate for LGBTQ equality, reproductive justice and voting rights. Followed quickly after on April 11th with *Planned Parenthood Lobby Day. ALL are great ways to get out in front of your legislators and support those with traditionally less political agency. This year Texas’s State legislature faces a decent amount of bills put forth to curtail the liberties of our fellow Texans-- especially considering that the current speaker of the house Dennis Bonnen (R-Angleton) has suggested he doesn’t plan to hear controversial bills on the floor during this session. Plenty of these bills aren’t expected to move too far because of Bonnen’s position on this, however, that doesn’t mean they aren’t threats to our community! SB22, a bill that would make it illegal for government entities to partner with or engage in certain transactions with abortion providers or affiliates (a clear attack aimed at Planned Parenthood who is heavily partnered with Austin and other major cities) has been moving forward despite being adamantly opposed by most democrats and all people pro-reproductive rights. "This is a bill that seeks to interfere with a local community's decision to make what it believes are the best health care decisions for the people who live in their local communities," - Former Senator Wendy Davis on SB22. Planned parenthood is already unable to receive state funds for their services, and this bill further cuts funding and access to critical care. There are more audacious bills on the table as well, ones that would alter the state’s constitution to make abortion illegal outright (SJR3) and four bills which attempt to attack requirements for employers to provide access for their employees to paid sick days. If you oppose any or all of these bills, there is plenty that can be done to make your voice heard. Donations are great! Groups like the Texas Freedom Network, Texas Rising, or Planned Parenthood directly advocate for reproductive rights and reproductive justice. For those of us with fewer funds, but who can spare the time for groups that share our message, being politically aware and active can often have a larger impact! Follow up with the Texas Freedom Network for further information on the bills submitted this and every session with their legislation watch. They are a phenomenal resource, and if you know of any groups you specifically support the work of, reach out and see if they have a legislation watch of their own. Stay woke. Keep updating your info. Get out there! *Note: Registration for Planned Parenthood’s lobby day is now closed however there is a rally happening at the capitol that day at 12:00 pm which is fully open to the public who want their representatives to see that they stand behind Planned Parenthood’s mission.